Pinetree Condominium an upmarket condominium in the Balmoral Park enclave has been been launched for en bloc sale with a reserve price of $148 million. 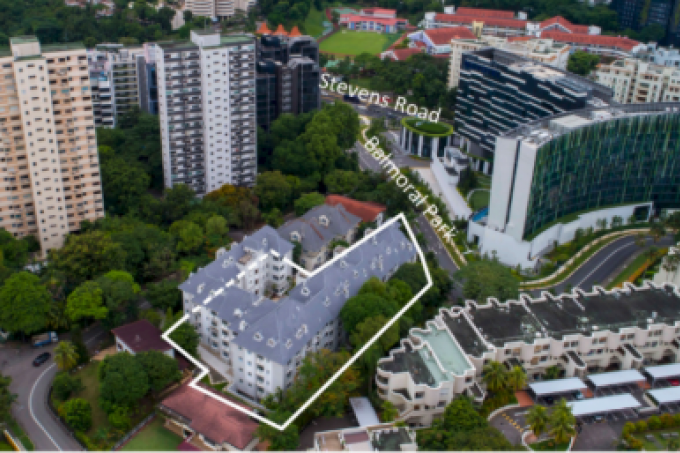 Each owner stands to receive between $2.57 million to $4.09 million if the en bloc sale is successfully concluded. SLP Scotia, the marketing agent for the en bloc sale of the upmarket condominium said that the site sits on 41,276 square feet (sq ft) of land, consisting of predominantly three-bedroom units measuring between 1,162 sq ft and 1,851 sq ft. The site is zoned ‘residential’ with a plot ratio of 1.6 as per the 2014 masterplan, which translates to a gross floor area (GFA) of 66,177 sq ft. Successful bidders would not have to pay development charge as the upmarket condominium’s baseline record from the Urban Redevelopment Authority (URA) is 75,115,71 sq ft. The upmarket condominium is situated in an ideal location in the heart of the metropolis. A shot distance from the redevelopment site are shopping centres, eateries, recreational establishments, educational institutions and everything else. Other nearby landmarks include the Singapore Botanic Gardens, Newton Food Centre, Shangri-La Hotel Singapore, and Novena Medical Hub. Several clubs like the Tanglin Club, The American Club, The Pines, and the Raffles Town Club, are also in the vicinity of the upmarket condominium. Located on a high ground in Balmoral Park, an exclusive residential estate off Stevens Road, Pinetree Condominium is near to the shopping belt of Orchard Road. Public buses are easily accessible outside the condominium and is within 5 minutes bus ride away from Scotts Road and Orchard Road. The Pan Island Expressway (PIE) is a short drive away too. It’s just a stone’s throw from all the modern comforts, like shopping centres, commercial centres, restaurants, entertainment establishments, hospitals, schools and a more. Prestigious schools like Raffles Girls’ School, Anglo Chinese School (Barker) and Singapore Chinese Girls’ School are within 1-km radius of Pinetree Condominium. The upmarket condominium is also next to Ardmore Park. SLP Scotia said that the site in which the upmarket condominium sits, may be redeveloped into a 12-storey project comprising 75 apartments with an average size of 70 sq m. The tender for Pine Tree Condominium closes on 30 August. Pinetree Condominium’s launch of the en bloc sale comes on the heels of the new property cooling measures. The Government recently imposed an additional Additional Buyer’s Stamp Duty (ABSD) of 5% that is non-remittable under the Remission Rules (payable on the purchase price or market value, as applicable) for developers purchasing residential properties for housing development. The Government said that being entities, developers will also be subject to the ABSD rate of 25% for entities. Developers may apply for remission of this 25% ABSD, subject to conditions (including completing and selling all units within the prescribed periods of 3 years or 5 years for non-licensed and licensed developers respectively). Details are provided under the Stamp Duties (Non-licensed Housing Developers) (Remission of ABSD) Rules and the Stamp Duties (Housing Developers) (Remission of ABSD) Rules. This new 5% ABSD for developers is in addition to the 25% ABSD for all entities. This 5% ABSD will not be remitted, and is to be paid upfront upon purchase of residential property. Real estate market watchers have suggested that the en bloc sales market will be hot by the new property cooling measures. If you are looking to buy a upmarket condominium, our Panel of Property agents and the mortgage consultants at icompareloan.com can help you with affordability assessment and a promotional home loan. The services of our mortgage loan experts are free. Our analysis will give best home loan seekers better ease of mind on interest rate volatility and repayments.